Mumbai: The country’s second largest two-wheeler manufacturer by sales, Bajaj Auto Ltd, on Thursday posted a 28% decline in fiscal second quarter (Q2) profit mainly because of the cost of retiring more than 2,300 workers. Net profit fell to Rs185 crore in July-September from Rs237.18 crore a year earlier, the company said. Total revenue (net of excise) rose 7.6% to Rs2,571 crore for the quarter, against Rs2,388 crore a year earlier. Its operating margin declined 2.7% year-on-year. Bajaj Auto posted a 4% growth in two- and three-wheelers sales by volume, selling 640,042 units, including a 31% increase in exports. The company beat analysts’ expectations. It increased its operating margin from 11.5% in the first quarter to 13.5% in the second. “Their performance is better than our estimates, taking their operating performance into consideration," Vaishali Jajoo, an analyst with Angel Broking Ltd, said. Profit was boosted by lower depreciation costs and provisions for taxes, she added. “The only surprise in the result is the VRS," said Mahantesh Sabarad, an analyst at Centrum Broking Pvt. Ltd. Items such as VRS are treated as one-time, extraordinary occurrences. 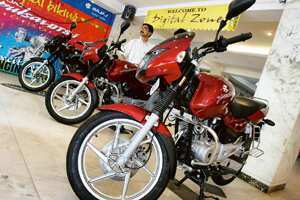 Bajaj Auto’s shares closed at Rs532, down 1.63% on a day when the Bombay Stock Exchange’s benchmark Sensex index shed 398 points, or 3.9%. The company attributed its improved margin quarter-on-quarter to its focus on 125cc-plus segment bikes and smaller three-wheelers in the goods carrier segment. It said it will launch in fiscal 2009 two new bikes in the 125cc-plus segment—which accounts for 36% of the motorcycle market—and a third developed specially for exports. This would help it secure its operating margin, the company said in a statement. On the outlook for the company’s net profit, Jajoo said, “They still show the raw material cost to be under pressure, hence on a year-on-year basis, it will still be on a negative side. If they can absorb the prices that are going down, it may help them improve margins," she added. A low volume base, coupled with new product launches, could help the firm improve sales in the second half of the fiscal, said Sabarad. Margins would continue to be around 13.5% for the remaining quarters, he said. “They will be on a rising volume trend, unlike Hero Honda, which will be through with the sales push after the festive season." Data from the Society of Indian Automobile Manufacturers shows two-wheeler makers posted an 11.5% growth with 3.86 million units sold in the first half of the fiscal year ending 30 September. Analysts anticipate volumes to decline once the festive season is over by October-end.